Follow Horse Illustrated senior associate editor Holly Werner on a first-hand account of each day’s events at Rolex. The second day of the Rolex Kentucky Three-Day Event saw warmer temperatures and greatly increased crowds. Thursday had only a smattering of spectators seated in the new, creatively named Outdoor Stadium at the Kentucky Horse Park, which seats 7,300 and was unveiled on April 22. On Friday, however, the bulk of the reserved seating under the new grandstand overhang was packed. 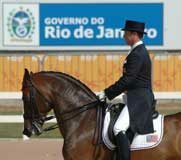 Separate reserved-seating tickets were required to come in and watch dressage, unlike Thursday. 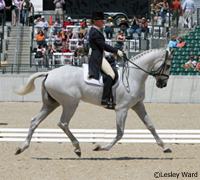 The crowd was definitely on the edge of their seats as the German team of Bettina Hoy and her stunning gray 18-year-old Irish Sport Horse, Ringwood Cockatoo, entered the ring. Showing incredible suspension and impulsion, one had to wonder how such a horse could also gallop and jump at full speed. Following a perfectly obedient halt that garnered marks of 9, 9 and 7 from the three judges, a score of 28.8 was announced. The crowd went wild as she eclipsed her nearest rival by an astounding 14 points, nearly unheard of at the FEI levels. Given a loose rein, the gelding gleefully poked his nose out and trotted out of the ring to receive his cheers. The confirmed Australian four-star team of Lucinda Fredericks and Headley Britannia, a 16-year-old Thoroughbred-cross mare, have already won Badminton CCI**** and Burghley CCI****. This test was bound to be good, and more than one 9 on the flying changes confirmed it. A final score of 32.3 was enough to secure second place. At last, however, the crowd got to see an American put on a show. Buck Davidson, son of veteran rider Bruce, had a fantastic, obedient test with a beautiful extended canter that yielded marks of 8 and 9. His score of 39 on the 13-year-old Irish Sport Horse gelding, My Boy Bobby, vaulted him into third place. The previous day’s leader, Tim Lips of the Netherlands, will go on to cross-country day on Saturday in fourth place. Something new this year, at least for me, was a cross-country walk given by the experts. Many of these are available through Purina, Smart Pak, U.S. Pony Clubs, et cetera. We opted for Smart Pak’s walk with 2009 Rolex competitor Jan Byyny and one of my personal heroes of eventing, Kim Severson (who has won Rolex three times with now-retired Winsome Adante, but unfortunately was not riding this year). The ladies inspected each challenging complex and gave an insider’s take on the fences. They were very warm and engaging, thankfully using megaphones to speak to the large crowd, and were happy to take questions at each fence. At course designer Michael Etherington-Smith’s world-famous water complex, called the Head of the Lake, Kim remarked that the drop into the water “didn’t look that big,” to which Jan replied, “Well, that’s because you don’t have to ride it!” Kim was quick to retort, “Thanks for rubbing it in!” It was good fun all around. Regarding food, lines had noticeably increased at all the vendors. The Horse Illustrated staff opted for the Greek delicacy of gyros, which were also available in vegetarian. Who can pass up a good yogurt sauce? A slower survey of the tack shops yielded some good results. After realizing before a jumping lesson last night that I had lost my crop, I was able to find a great replacement for only $5. Compared to the $35 whip that tried to woo me with its custom colors, there was no question which to buy. I also found a tempting lead rope in the difficult-to-find combination of navy and silver that I’ve chosen for my horse supplies, and another $3 was gone. The final stop was for a synthetic shaped girth I had spotted the previous day–what luck, there was only one 48 inch left! It was soon on its way home with me. < < Read previous Rolex story. Sounds great. Keep up the good reporting.